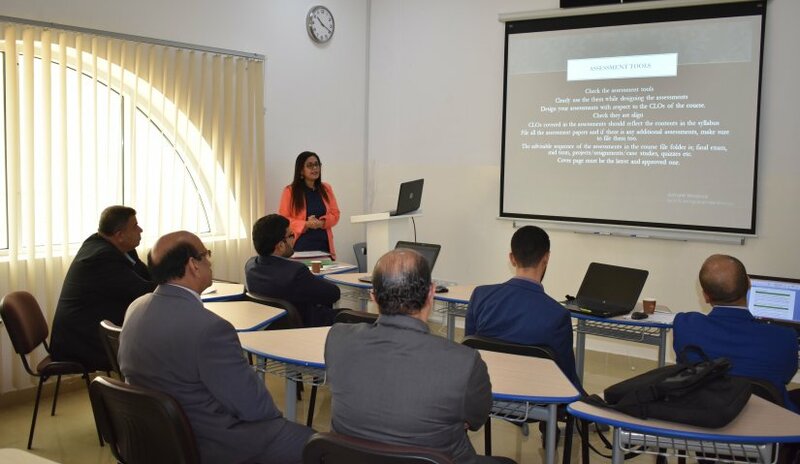 Dr. Roohi Hasan Imtiaz, Assistant Professor from College of Business Administration delivered a lecture on course files as part of professional development of Al Falah University’s academic staff. The lecture aims to highlight the importance of preparing accurate course files by following certain basic guidelines. Various documents such as updated forms, exam papers, cover pages, were provided in order to help the faculty members prepare their respective course files on time and up to the required standards of AFU and Ministry of Education. Prof. Khalifa Jaber, Dean, Dr. Panagiotis Kokkalis, Head of Department of Business Administration and Human Resource Department and other COBA faculty members attended the lecture held in the Professional Development Training Room.